Using Shiftboard, Maker Faire slashed event management and scheduling admin time by 70%. Maker Faire is a festival that attracts everyone from tech enthusiasts and tinkerers to engineers and artists, and has been called “The Greatest Show (and Tell) on Earth.” The event’s broad appeal resulted in exponential growth-expanding from a one-city event with 22,000 attendees in 2006 to a bi-coastal festival with 235,000+ visitors just a decade later. Managing event production, costs, and logistics with out-of-the-box event scheduling software proved too limited to keep pace. Organizers turned to Shiftboard for its sophisticated scheduling, centralized management, and configurable reporting to help them effectively manage 560% growth in under 10 years. Maker Faire celebrates the maker movement-arts and crafts, engineering and science projects, and Do-It-Yourself designs of all kinds. The focus on creativity and resourcefulness combined with a family-friendly environment led to explosive growth. Staffing, budgets, and logistics grew increasingly complex at breakneck speed, while visibility into operations, such as scheduling and communication, became more important than ever. Email chains, phone calls, and spreadsheets quickly gave way to out-of-the-box event planning software that required managers to worker around inadequate shift scheduling capabilities and wrestle with clunky spreadsheets. With no way to organize or interpret the data flooding in, organizer’s ability to make fully informed business decisions was jeopardized. Plus, a lack of mobile access severely limited on-the-go coordination, which is essential on event day. Straightforward event management had evolved into a web of extremely complicated processes, and something as simple as confirming how many people had arrived on site and where was impossible. Maker Faire organizers chose Shiftboard—highly adaptable, user-friendly, and fully customizable event staff scheduling software. Rather than each manager using separate spreadsheets and systems, Shiftboard consolidated information into a single, coordinated command center, making it easier to synchronize efforts and oversee the entire event. Maker Faire must comply with extensive communication and documentation regulations for each of its many staff classifications. Shiftboard consolidates compliance data in one place, and the advanced reporting feature reduced the time required for legal processes by 50%. 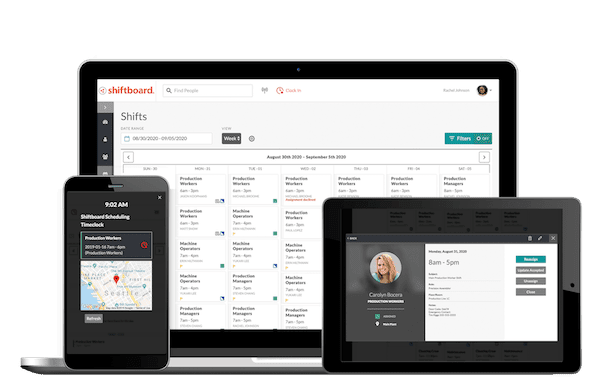 By managing all staffing and event-related data in Shiftboard, organizers are able to run detailed reports to make informed decisions based on relevant information in real time. By adjusting reports for specific needs, they can quickly assess everything from how many hotel rooms are booked on a particular night to how many radios are checked out at once. Event details like schedules, transportation, and meals had been managed and confirmed through an inefficient system of cross-referencing email threads and voicemails. “With Shiftboard, we’ve secured all our staffing information in one database. Our workflows are greatly improved and our managers have a clear view of reliably accurate info 24/7,” said Moore. Shiftboard’s operational visibility helped Maker Faire save money and better manage their finances by avoiding “lost costs,” like avoiding extra lodging fees and planning airport shuttles to maximize passengers per trip. Shiftboard’s intuitive, user-friendly interface received positive feedback from workers with all levels of technical backgrounds, and easy schedule access to confirm details and update availability improved overall morale.